As I’ve been preparing for my talk at the MomLife Bootcamp this weekend, I was once again reminded that my life is not conducive to completing projects in a timely and organized manner. I used to be an organized person…or at least I used to be able to appear like an organized person. In my pre-mommy life I was a conference planner, but that was before 5 other people could mess with my schedule, my to-do list, and my sanity. I really am a planner at heart. I really want to be that organized, put together, getterdone, check things off my list kinda gal. But I always seem to be waylaid. I’d like to be able to accomplish SOMETHING! Anything!!! There is always something that sneaks up and changes the dynamics of my day. I’ve said before that I feel like I’m always flying by the seat of my pants because my best-laid plans are for naught most days. Spontaneity is great for a night out but not as a way of life. I’m wondering if maybe putting a little bit less on my to-do list would be helpful…then maybe I could end the day without feeling disappointed. My kids want me…just me. Not me and a perfect house…you can’t have any fun in a perfect house anyway. There are a lot of sayings about a messy house being a happy home. I get the idea to a point but a little order is good…right? I think the key is finding balance, understanding my priorities, relaxing. Maybe relaxing some of our expectations…the reasonable ones and the unreasonable ones. Honestly, we all probably need to relax in general. I know…show me how, when and where and I’m there. As much as I wish relaxing was a glass of sweet tea, a good book and a hammock…mine is more sitting on the grass watching my son’s soccer game, putting aside my work to enjoy my daughters riding bikes in the culdesac, or sharing the sofa with 3 or more children to watch a movie. In some ways maybe it’s an attitude. Choosing not to stress about the stuff we can’t fix and maybe even the stuff we can. I think it’s okay to be still and quiet and rest. Okay, so how are we gonna do this rest thing? I’ve been trying to figure it out for days, months…years. When was the last time I felt rested, calm, and strong? Actually I do remember a time. It was right after my husband announced he wanted to leave. Those months of anguish were also months of profound peace and calm. I believe it was solely because I was saturated with Scripture. I also had a clarity about what was important. And it wasn’t accomplishing great things nor was it a clean house or work completed. It was and always will be my children. 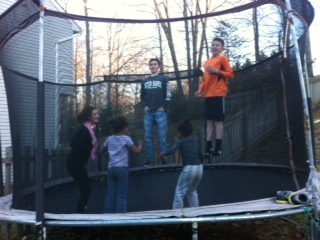 Tonight my children asked if they could all go jump on the trampoline. It was close to bedtime, but I wanted to work a little bit longer on my talk, so I said, “Ok, just 10 minutes.” As I sat near the window listening to my children laughing and playing, I couldn’t stop thinking that I wanted to be out there with them. I just had to put my stuff aside. When I walked out barefoot ready to jump, my kids all asked, rather incredulously, “Momma, are you going to jump with us?” I cannot tell you how thankful I was that God had prompted me to put aside the important for the most important. I guess it’s rather simple, isn’t it? Soaking up the scripture and pouring into our children. That’s not too much to organize! I might be able to do that! I know that there is much more to it than that…living this single parent life is so difficult and overwhelming at times. But maybe we need to take our eyes off of all the craziness and focus on Christ and put aside the to-do list and focus on the people in our lives. Maybe we can stop trying so hard to do so much and we can just be for a bit. Be in prayer. Be in the Word. Be with our people. God’s got this. He’s got our. He’s got us. He’s even got this silly talk I can’t seem to get my head around. I’m so thankful. Previous Article Anyone Else Feel Done? Amen and amen, sweet sister! I’m so glad you went out to play! I too feel as the single parent, when everything falls on you, it is had to relax or find that place you can relax. I do try and have more time with my kids when they are awake and do my things at night, that might explain being tired a lot, but sleep is over rated anyway :). Aw, this made me smile! Warmed my heart and encouraged me. God has got this. I’m glad you went outside and spent time with your kids. So many times we get caught up in the things we think are important and God gives us an opportunity to do something He wants us to do. Remember there are several references where Jesus “rested/reclined” with his friends. He used this time to teach and build relationships. These play times are great teaching times or just plain fun.